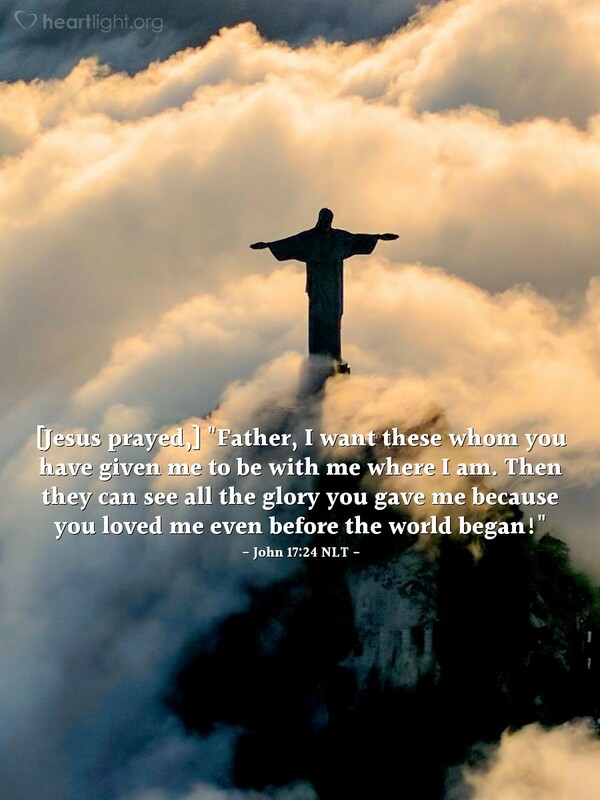 [Jesus prayed,] "Father, I want these whom you have given me to be with me where I am. Then they can see all the glory you gave me because you loved me even before the world began!" So often, we try to find glory for ourselves while we are here on earth. In our brief span of years, we try all sorts of ways to gain glory in the eyes of others. True glory, however, comes only from the Lord! Jesus longs to share his eternal glory with us. He had this glory with the Father before coming to earth. He has it now as he sits at the Father's side. Even now, Jesus longs to share his glory with us. He longs to have us by his side, gazing at him in all his heavenly glory along with the glory of his angels. Let's look forward to this future with anticipation as we wait for the day we will see Jesus, face-to-face, in all of his glory. O Lord God, my glorious heavenly Father, I long for the day that I can see you and your Son in all of your glory. I know my limited imagination cannot even begin to grasp the beauty, majesty, and brilliance of your glory. Please stir my passion and steel my will to live with purity and holiness for that day of glory. In Jesus' name, I pray. Amen.